The course covers the main aspects of the Orchestra Conducting baton technique. It is directed at musicians who would like to approach the art of conducting for the first time, as well as conducting students who would like to refresh or deepen their understanding of the main technical aspects of the profession. The activities and exercises are tailored to the abilities of each student and all the sessions are videotaped in order to review and give individual-specific feedback. The course is open to all levels of conducting experience. The course is open to a maximum of fourteen (14) active participants. On Monday, 8th July, the assessment will take place from 10am to 1pm. Lessons run from Monday the 8th to Friday the 13th, 6 hours per day, in two sessions separated by a break: from 10am to 1pm and from 2:30pm to 5:30pm. The total coursework comprises 30 hours. The first session of each day (from 10am to 1pm) is devoted to conducting technique. All the active participants will receive coaching focused on her/his conducting technique. The second session of each day (from 2:30pm to 5:30pm) is held with a string quintet and a piano. Each active participant takes turns conducting the ensemble for a total of 10 minutes, whilst being coached by the instructor. As stated above, all the sessions are videotaped in order to review and give individual-specific feedback. Some exercises in the form of short pieces will be given during the course. The cost of the application is Euro 20 and this must be received by June 21, 2019. The application fee will be applied to the cost of the tuition if the applicant is accepted. Notifications about the status of the application will be sent on or before June 30, 2018. Italian born, London based, Bruno Cinquegrani is the former Associate Conductor of the Los Angeles Opera and the former Associated Conductor of the Crimean State Philharmonic Orchestra. He studied Piano and Composition in his native Naples, Italy, and Orchestra and Chorus Conducting in Mannheim, Germany. He was then awarded a Conducting Fellowship at the Aspen Music Festival studying Orchestra Conducting with David Zinman, attending a masterclass with James Levine and performing at the Harris Hall and B. Bayer Music Tent. During the 2017/2018 season, Bruno will record (among other commitments) some Symphonic Poems by A. Kurylewicz with the National Radio Orchestra of Poland (NOSPR). In June 2013, he started his collaboration with the “Fundacja Forma” (Warsaw) for the public performances and recordings of the music of Andrzej Kurylewicz. He conducted two concerts in collaboration with the National Orchestra of Poland at the Warsaw National Hall during the “Andrzej Kurylewicz Music Days” Festival. During the 2012/13 season, he made his operatic debut at the Teatro di San Carlo with Il Campanello. Further previous debuts include Traviata at the Bunka Kaikan Theatre in Tokio during his first Japanese tour, Lucia di Lammermoor at the Seattle Opera, Cenerentola at the Aspen Music Festival and Elisir d’amore at the Opera Holland Park, London, with the City of London Sinfonia. He also conducted Marino Faliero and Traviata (Bergamo Musica Festival), W Gianni Schicchi (Teatro Massimo, Palermo), Lucia di Lammermoor (Teatro Comunale di Bologna), Lucrezia Borgia (Teatro Verdi, Sassari) and Falstaff (NSO Tour). In April 2011, the recording label NAXOS has released for world-wide distribution in DVD and CD his live recording of the Donizetti’s opera Marino Faliero at the Bergamo Musica Festival. Bruno Cinquegrani has collaborated with singers such as Placido Domingo, Thomas Allen, Mariella Devia, Ruggero Raimondi, Paolo Gavanelli, Alexandra Kurzak, Ana Maria Martinez, Patricia Racette, Stefano Secco, Saimir Pirgu, Francesco Meli, Stephen Costello, William Burden, and directors such as Woody Allen and Elijah Moshinsky. As a former Associate Conductor of the Crimean State Philharmonic Orchestra, he is an experienced symphonic conductor. In Crimea, he gave more than fifty concerts in two seasons conducting works (among others) by Mozart, Beethoven, Bruckner, Tchaikovsky, Sibelius, Moussorgsky, Mendelssohn, Schumann, Strawinsky and Strauss. Further performances include concerts with the Orchestra of Teatro di San Carlo, National Orchestra of Poland, Belgrade Philharmonic and National Orchestra of Ukraine. In 2007, Bruno Cinquegrani started his collaboration with James Conlon. He worked with him on Simon Boccanegra at the Opera Bastlle, on Falstaff at the Teatro Comunale di Bologna, and on Gianni Schicchi, Elisir d’amore, Simon Boccanegra , I due Foscari and Cenerentola at the Los Angeles Opera, where in June 2013 he completed his tenure as Associate Conductor. Further collaborations include Madama Butterfly and Traviata at the Aspen Music Festival with David Zinman and Julius Rudel, Rigoletto at the Royal Opera House with Renato Palumbo and Maurizio Benini, Turandot at the National Theatre in Helsinki with Muhai Tang, La Gazza Ladra at the Garsington Festival with David Parry, and the recordings of Didone and Vologeso for the label Orfeo with Frieder Bernius. 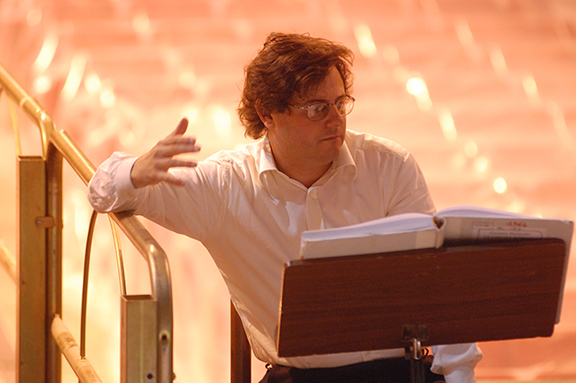 In January 2012, Bruno Cinquegrani was invited by the Domingo–Thornton Young Artist Program at the Los Angeles Opera, to coach young singers on the interpretation of the Italian repertoire. Since January 2015, Bruno teaches Orchestral Studies and Orchestra Conducting at the “A. Corelli” Conservatoire of Messina, Italy.